Welcome to Holy Cross: The Orthodox Church serving the Greensboro, Winston-Salem and High Point area of North Carolina with services entirely in English. Our Church did not begin in the 20th Century, or the 19th, or even with Martin Luther in the 16th Century. Our Church began when Jesus Christ established it more than 2,000 years ago through His apostles, and promised that the gates of hell would never prevail against it. In the East, where Christianity began, there was no Reformation, because there, Christianity hadn't gotten lost, and didn't need to be reformed. This Church came to be called Orthodox because it has held fast to what it was given, has remained true, Orthodox, since the beginning, 2,000 years ago. Many Orthodox churches in America were established to serve the needs of an immigrant population, and to faithfully transmit and preserve the rich cultural heritage, traditions and language of a specific nation of origin. We at Holy Cross, however, are a diverse American community of ordinary people from many different ethnic and cultural groups, and our services are entirely in English. We are a very warm and open community and we welcome all visitors. Prayer and Worship: Ancient, Timeless, Beautiful. We believe that in this church, we stand in the very presence of God, and that we join the saints and heavenly hosts in joy and prayer and worship. Orthodox worship engages the whole person: the mind, the heart, the senses, the entire body as we stand, bow, and make the ancient Sign of the Cross as Christians did in Apostolic times. Jesus and his Apostles prayed in many different ways, sometimes privately, sometimes together. Jesus prayed and taught in the Temple, his Father's house. The services of the Temple included formal liturgical services composed of prayers that all present heard together and prayed together. The Apostles and most of the very first Christians were Jews, and accustomed to praying in liturgical services in the Jewish Temple. Following the Divine Liturgy, around noon, we gather for a “coffee hour” with some light food, coffee and tea. Please join us for reverent and joyful worship, and please stay after the services for refreshment, food, and fellowship! As the parish has grown, the need for space has become increasingly pressing. Being crowded is a blessing, but also a persistent inconvenience during both worship and fellowship hour, so we all voted unanimously to purchase land in Kernersville, in an excellent central Triad location. 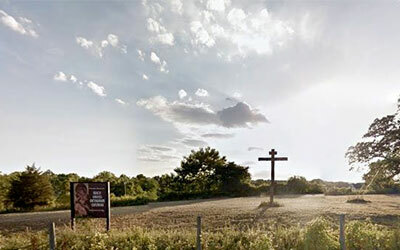 Through personal donations, fundraising efforts and assistance from the Diocese, the land has been fully paid off. We then mounted a successful Capital Campaign (please see our Raising the Cross website for more information), and we are expecting to begin building our new temple in 2018! 1320 Masten Drive in Kernersville. Please see our Building Project Log for more information. Before all other deeds, remember about this great deed: that your children, innocent and pure children, take into their pure hearts the Law of God, the commandments of Christ, at least from the small amount of instruction that they can receive from you. You have not yet forgotten the Law of God, so teach, teach your children, and then your family will become your house church. And the light of Christ from this house church will spread invisibly for you beyond the boundaries of your family. The Light of Christ, His Divine Truth, will invisibly flow into the hearts and minds of all those who have dealings with you. It could be that the influence of your house church will go beyond its boundaries. Forgiveness Requires Courage: Fr. Alexis Trader. We We have photos from the Sunday of Orthodoxy. We We have photos from the Sunday of Forgiveness. We We have photos from Nikolai's baptism! 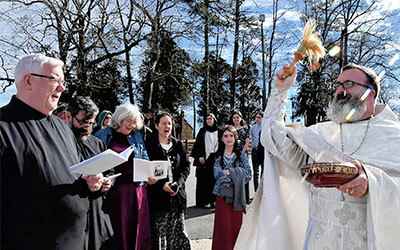 We celebrated Holy Theophany, and after, the Outdoor Blessing of the Waters. Children and adults sang Christmas carols just before Christmas. St. Nicholas visited Holy Cross! We have photos from Pentecost, and the chrismations on Pentecost! We have some photos from the services on Holy Friday! We have some photos from the services of Pascha! Palm Sunday was a festive celebration, with our yearly photograph of parish children after the procession. On Soul Saturday, Father Christopher celebrated a teaching liturgy, teaching during the Proskomedia and the Divine Liturgy. On the Sunday of Orthodoxy, we had a procession with icons and took a photo of the children. 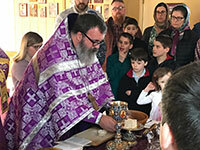 In the first week of Lent, parishioners gathered to pray the penitential Canon of St. Andrew. We began Lent with the Rite of Forgiveness. Thanks to Whitney for wonderful photos from the Outdoor Blessing of the Waters on the Sunday following Theophany.. Thanks to Sergey for photos from the John Luke's Baptism on the Sunday after Nativity! Thanks to Sergey for many more photos from the baptisms and chrismations just before Nativity! We have photos from the children's Nativity Play! Our celebration of the Nativity of Christ began with a beautiful and joyous Vigil service. We celebrated 5 baptisms and 11 chrismations on the Sunday before Nativity! The first of 2017's Nativity Prefeast services began the final stage of prayerful preparation for Holy Nativity. St. Nicholas visited Holy Cross this year again, and later, many parishioners and their children sang Christmas carols at Adams Farm Living and Rehabilitation, where our brother George of blessed memory used to live. Father Christopher gathered together the parish children who are approaching the appropriate age and offered them some teaching about confession. After so many years of hoping, researching, planning, preparing and praying, at last we had our first meeting with the builders, initiating the actual path toward building our new church! For more parish news, please see our Parish News, Photos and Videos page.